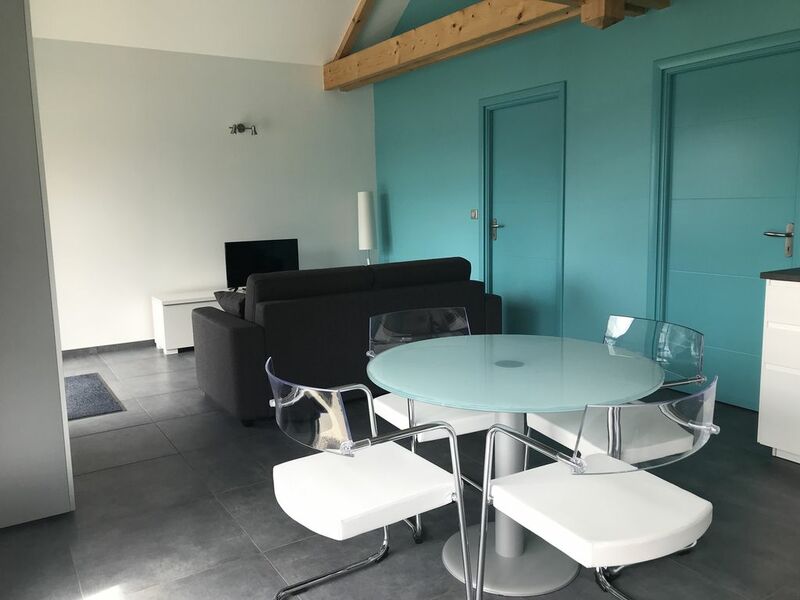 This architect house, built in 2017, will offer you all the comfort and tranquility to spend a pleasant stay in Savoie. It is located at the end of a cul de sac in a quiet and peaceful hamlet just 8 km from Aix-les-Bains. Outside, the view is beautiful especially at the sunset on the Dent du Chat. An ideal stay between lake and mountain! The living room is very bright, consisting of an integrated kitchen open to the living room. The bay window gives access to the private terrace facing south with garden furniture. The bedroom has a 140 cm bed with memory foam mattress, 2 bedside tables, a dressing room with drawers, shelves and hangers. A convertible sofa 140 cm is available in the living room. Bed linen and towels are provided as well as all the necessary kitchen (plates, cutlery, glasses, stove, pots ...). In summer, you will be able to protect yourself from the heat thanks to the BSO (adjustable shutters that allow you to protect yourself from the sun while letting in the light in the house). The GPS will guide you without worries and you can park in front of the house. Nous avons passé un excellent séjour chez Claire qui est très accueillante. Le logement est très propre et on trouve tout ce dont on peut avoir besoin. Le village est très calme et proche des principales villes : Aix les Bains, Annecy, Chambéry....idéal pour découvrir la région! Nous reviendrons et conseillerons cette adresse à notre entourage.